GHOST PAL is a paranoid, psychedelic soul band from Brooklyn, NY. 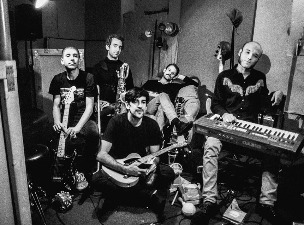 Having expanded and contracted for the better part of a year as a psychedelic and occasionally psychotic collective, the Brooklyn-born, genre-straddling outfit is led by Oliver Ignatius, when he isn’t busy running the recording studio MAMA COCO’S FUNKY KITCHEN. Over the years the group has moved from a loose collective of members to a 7-person strong crew trying to destroy and rebuild noise pop, with elements of psychedelia, funk, and garage rock finding their way into the fold. Blending indie rock, pop and soul into a delectable stew of sound, ARIADA is a Chicago-based outfit rapidly gaining a national foothold after a year of tremendous local growth. With comparisons to THE DOORS and ALABAMA SHAKES, and the powerful presence of Lesleigh Arratia’s vocals, it’s no secret that ARIADA are going places fast. Opening up this hump-day delight is NO SHOES, a New York based group who’ve been carving post-apocalyptic pop songs out of math rock structures. The proggy pop-rockers have an affinity for high energy sets and eclectic time signatures, with hints of noisy shoegaze and experimental art-rock thrown in for good measure.